The visit of Chinese President Hu Jintao to the United States in January produced business deals worth US$45 billion and the promise of a half-million jobs. U.S. President Barack Obama used that scorecard to make Americans feel less intimidated by China's economic might. But investment commitments were 10 times as large earlier in January at a four-day "Vibrant Gujarat" road show in Gujarat's capital city of Gandhinagar. Similar events that month in Maharashtra and Punjab and a central government event for overseas Indians produced a fraction of those investment deals. Though Gujarat still nurses scars from bloody communal riots in 2002, its attractive investment climate scored when compared with the sentimental draw associated with non-resident Indians (NRIs) investing in their homeland. India Knowledge@Wharton talks to economic development experts to understand what drives such deals. Gujarat's example may offer a lesson in strategic positioning, business planning and execution. At Vibrant Gujarat, the state showcased its infrastructure readiness such as construction-ready land lots, an eager government administration, and power and water. It displayed its wares at 33 events and exhibitions over four days before 1,400 delegations from 101 countries, striking 3,000 memoranda of understanding (MoUs) besides winning commitments totaling US$450 billion that promise 5.2 million jobs. The noteworthy domestic investors included the Anil Dhirubhai Ambani Group, which committed to invest up to Rs. 50,000 crore (US$11 billion) in gas-based and coal-based power plants in the state over the next five years; the Tata Group, which pledged Rs. 30,000 crore (US$6.7 billion) and 50,000 jobs in housing, automobiles and rural distribution networks; and Anand Mahindra of the Mahindra & Mahindra Group, who offered to invest Rs. 3,000 crore (US$670 million) in hospitality and real estate, calculating that the multiplier effect would create 100,000 jobs. "Forget the part about the financial commitments; we see this as a big investment if we can do some skill development and knowledge sharing," says Maheshwar Sahu, the state industries secretary who is credited with orchestrating the event. "Investment flow into the state is only a small part of the objective of this event," Modi said in his inaugural speech, adding that he wanted Vibrant Gujarat to "energize global networking for knowledge and technology sharing; to learn the best practices and to encourage the people to think big and take up challenging projects." 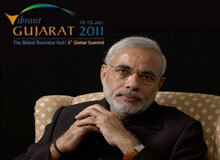 In fact, this was the first Vibrant Gujarat event that invited other states to set up stalls and pitch to investors. "Instead of being competitors, we allowed 15 country and state seminars to market themselves," says Sahu. "We feel happy when somebody [else] does business on our soil." Karnataka state, for example, signed MoUs worth Rs. 30,000 crore (US$6.7 billion) at the event. Despite the positioning of the event as a platform for big thinking and relationship-building, "eventually it was all about business," says Rafiq Dossani, a senior research scholar at Stanford University's Shorenstein Asia-Pacific Research Center in Palo Alto, Calif., a speaker at the event. Vibrant Gujarat was also successful because Modi was among its chief attractions, adorning newspaper ads, billboards and posters, and bear-hugging industrialists in photos. "It seemed to be organized very much around the presence of Modi, almost a cult figure," Dossani says. "To some extent, the organization coalesced around that. Having one strong person helps." Modi was in the forefront also because he belongs to the Bharatiya Janata Party, the political rival to the Congress Party that leads the national government, Dossani says. "If the ruling party in the state is also [ruling at] the center, they wouldn't be so bombastic because they would be getting what they wanted from the center — like Maharashtra and Delhi," he says, alluding to massive airport expansion projects under way in Mumbai and New Delhi. The agenda was nowhere as aggressive as Modi's at the 9th Pravasi Bharatiya Divas (Overseas Indian Day) in New Delhi a few days earlier. Vayalar Ravi, minister for overseas Indian affairs, said the event was focused on the "young global Indian … to facilitate their discovery of cultural heritage and opportunities in emerging India." A "Gulf Session" at the event sought to address the needs of some six million Indians who work in the Middle East and remit nearly US$30 billion annually. Montek Singh Ahluwalia, deputy chairman of India's Planning Commission, made it clear that the event was not chasing dollars. "I think we can get rid of the notion that we are connecting with the NRIs because we want investment," he said. "We are not reaching out to NRIs because we need money. The NRIs' share in the foreign direct investment in the country is just 1.3%." In February, the government followed up Pravasi Divas byallowing NRIs to vote and stand for elections in India, fulfilling a longstanding demand of NRIs. Punjab state positioned itself as an investment destination at its NRI Convention held a week later in the industrial city of Jalandhar. But the visiting NRIs were apparently not sufficiently enthused, according to a Times of India report. "Visiting Punjabi NRIs give zero, Gujaratis shower $450 billion," a headline read. But Ruby Dhalla, a Canadian Liberal parliamentarian who attended, defended the state's efforts. The deputy chief minister "did a great job showcasing Punjab at the NRI conference. Punjab is a great place to invest for NRIs," she tweeted, according to media reports. Promoting first-generation entrepreneurs and tier-two towns were the objectives of the Global Maharashtra Trade Fair and Conference in Aurangabad earlier in January. This event also was not aimed at attracting investments, maintained Mansingh Pawaar, president of the Maharashtra Chamber of Commerce, Industry & Agriculture, which hosted the event. Even so, the event had delegations from 25 countries including the United States, the United Kingdom and Japan, as well as emerging economies. It resulted in several MoUs in automobiles, chemicals, wineries and information technology that are likely to bring investments, Pawaar says. An unidentified German automobile company has committed to invest in the state, an investment that could be worth Rs. 500 crore (US$110 million) and create more than 2,500 jobs, he adds. "We are talking about first-generation investors going global," says Pawaar, underlining that his event did not pursue NRIs or purely business investments. The action at Vibrant Gujarat was consistent with the state's 11.2% GDP growth target in the five-year plan ending 2012, says Sunil Parekh, strategic advisor to pharmaceutical company Zydus Cadila and others. He also is chairman of an association of 550 Indian Institutes of Technology graduates who work in Gujarat. The group made several presentations at the event, focusing on 15 areas for technological development. The Gujarat pitch is matched by the state's "exceptionally entrepreneurial" people and a responsive and proactive government, Parekh says. He points to a decade's worth of planning that has equipped the state with a gas pipeline and distribution network that covers most cities, and has attracted investors such as British Gas. The Modi administration has also "painstakingly gathered land at fair market prices with consent from farmers — never by force," he adds. The Tatas' Nano small-car project was a beneficiary when it wanted out from West Bengal state where it encountered opposition from farmers over land acquisition a couple of years ago. "We will never have a problem like Nandigram (in West Bengal)," where, in 2007, protesting villagers clashed with the police over a proposed chemicals complex, leaving 14 villagers dead. Gujarat is also on its way to becoming a power-surplus state — a major differentiator from power-deficit states such as Karnataka, Parekh says. The state leads the country in solar energy installations. More than a dozen investors including Sharp, Panasonic and Mitsui have taken up pieces of a 500-megawatt solar project at Patan in north Gujarat making it the largest in Asia, he adds. Sahu says the state's plan is to generate up to 2,000 MW from renewable energy sources over time. Gujarat has also "got its act together and understood the needs of investors, foreign and domestic," Parekh says. The state, in partnership with Japanese firms including Itochu and Mitsubishi, is planning 16 new cities along the Delhi-Mumbai Industrial Corridor, he says. These would be eco-friendly cities, complete with green buildings, energy conservation capabilities, waste recycling and mass transit. A state that has historically been short of water, Gujarat has interconnected the rivers that feed it. It also has reserved 500 hectares near Ahmedabad for prospective companies from Taiwan and Korea. "Land has been parceled, and it is ready to go, plug and play," Parekh says. Even as the checkbooks were out at Vibrant Gujarat, the state administration realized it could face a talent crunch when investments take hold. That was the backdrop for 479 MoUs it struck for knowledge-sharing and capacity-building, including 307 for skill development and 142 for networking between universities. Sahu says the state's skill development programs aim at creating a talent pool of at least 200,000 people annually from 2013, or a million skilled people in the next five years. Parekh's top concern is that the state "is not innovative" enough to power its growth plans. "The number of patents being filed by Gujarat is very, very low," he says. "We are masters in manufacturing but we also have to create new knowledge." In one stroke to tackle both the talent crunch and foster a spirit of innovation, Parekh has tapped foreign universities to form "knowledge partnerships" with local learning institutions. He arranged for 31 international universities to be represented at Vibrant Gujarat, including the University of California, Berkeley and the University of California, Los Angeles, and Sweden's Karolinska Institutet, one of Europe's largest medical universities. Some 14 partnerships were struck at the event, Parekh says. The Gujarat government "has actively facilitated these partnerships and provided the platform … to start looking at new collaborations so universities can provide a global outlook." The availability of the right kind of talent is often the decisive factor for businesses in deciding where to locate their operations or expand, says Daniel Levine, principal at MetroCompare, a consulting firm in Fanwood, New Jersey, that advises businesses in site selection and negotiating economic incentives. A former government executive, Levine helped guide state policies in attracting business relocations and expansions from New York to New Jersey, including Goldman Sachs and Merrill Lynch. "University and education systems and training programs are really good ways to encourage companies," Levine says. "One way to give comfort is if you have a local university that is graduating students." He recalls that talent availability was the chief reason Swiss pharmaceutical giant Novartis preferred Cambridge, Massachusetts, over its New Jersey U.S. headquarters a few years ago to house its expanded R&D operations. Cambridge scored because of its access to the students and research at the Massachusetts Institute of Technology, and a talent pool in biomedical research, vaccines and diagnostics. Governments could also step in with public-private partnerships of the kind Gujarat is attempting, Levine says. For example, IBM has entered into a partnership with the State University of New York to train nanotechnology workers. A focus on quality-of-life issues including good schools, housing and roads helps in attracting and retaining top talent. Silicon Valley has attracted talent globally precisely because of these factors, he says. States could earn bonus points for pro-business policies, but some stigmas are difficult to shake off, Levine warns. In India, corruption in government has been a major turn-off for business. Business leaders including Wipro's Azim Premji, Mahindra & Mahindra's Keshub Mahindra and HDFC's Deepak Parekh recently complained about a "governance deficit" in an open letter to the central government. Scandals in recent months have plagued governments in Maharashtra and Karnataka and the central telecom ministry, among others. "We are alarmed at the widespread governance deficit almost in every sphere of national activity covering government, business and institutions," the businessmen wrote. "Widespread discretionary decision-making has been routinely subjected to extraneous influences." Gujarat didn't figure in those scandals, and Parekh attributes that to transparency in the state administration. He says various state secretaries meet monthly to review investment proposals. "The junior officers call the investors and ask them what stage their investment is at, and de-bottleneck things," he adds. Gujarat, however, continues to deal with the ghosts of riots following the torching of a train that killed 58 Hindu passengers at Godhra in 2002. According to official estimates, 790 Muslims and 254 Hindus were killed in the riots. Sahu and Parekh say Godhra — as the carnage is described — is not an issue with investors. "Nobody asked me about Godhra. That is buried in oblivion," Sahu says. "Possibly people had more faith in the stable policies of the government and its leadership," he adds, explaining Vibrant Gujarat's success. Dossani says Godhra has left deep scars. "It is still a ghettoized state as far as Muslims are concerned," he says. "People say Muslims are doing better compared to other states and I am sure there is still some truth in that because a rising tide lifts all boats." All the same, Dossani feels that while the Modi regime tries its best to banish memories of Godhra "and focus on growth," it is also being "naïve" in its denial of the problem. "A population where 10% is getting ghettoized will slowly become a millstone around the necks of the 90%," he says. "But that takes a long time." As Dossani says, the Modi administration would ensure against a repeat of the Godhra violence. Levine says states could overcome such stigmas by getting businesses to share happy experiences. "The experience of other businesses is a real testimony," he says. "The best recourse is to have executives meet one on one with each other and talk about experiences they have had. Foreign investors could talk about highly integrated work forces, great teams, etc., and give testimonial support that the community has figured out a way to move forward."